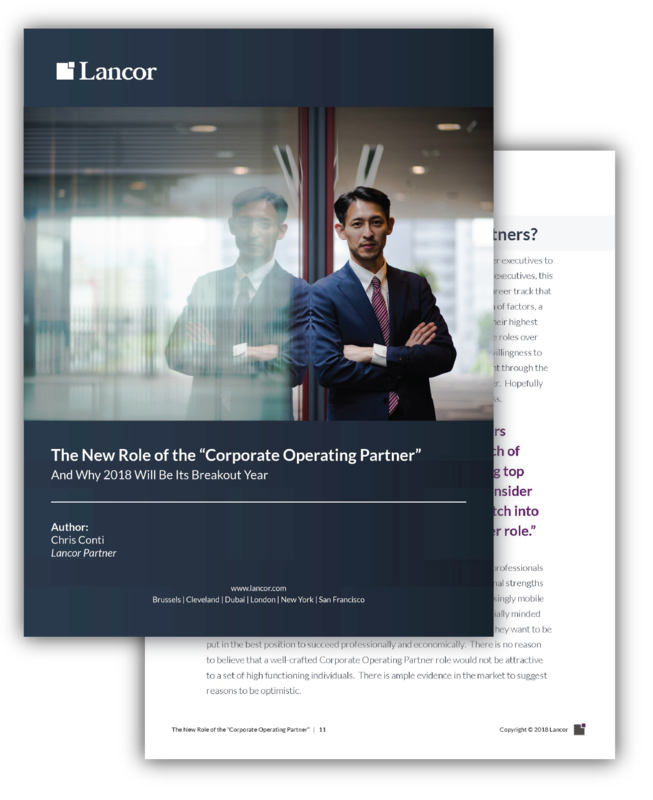 The New Role of the "Corporate Operating Partner"
In a quiet fashion, over the last couple of years, we at Lancor have seen momentum build in support of a newly created C-suite role: one that fundamentally shifts the focal point for change across businesses of all sizes. The actual title varies by company and by industry, but in our experience, the person’s mandate is the sure give-away. CEOs are hiring senior leaders to run dynamic transformation programs across all areas of their businesses in an effort to mimic the success seen in the private sector when Private Equity firms transform their portfolio companies. These executives are the mirror image of Private Equity Operating Partners, except for the publicly traded sector. They assume roles related to improving strategy, processes and cost, shared services and governance issues, while sometimes even serving as internal replacements for external strategy consultants. Perhaps it's inevitable that best practices would cross-pollinate between the public and private settings. Or maybe this is further evidence that the Private Equity "playbook" for company transformation is legitimate. This article examines this unique new role and why 2018 will be the year when the "Corporate Operating Partner" enters our business management vernacular. Complete the form on this page to download the full article.